Andre M. Poineau has been designing furniture, casework, bridges, artwork and homes for 28 years. In 2000, Andre M. Poineau Woodworker, Inc. added the services of Architect Paul King to the staff. Paul is a graduate of Miami University with a degree in Architecture and Landscape Architecture. Together they bring a combined total of 55 years of design experience. 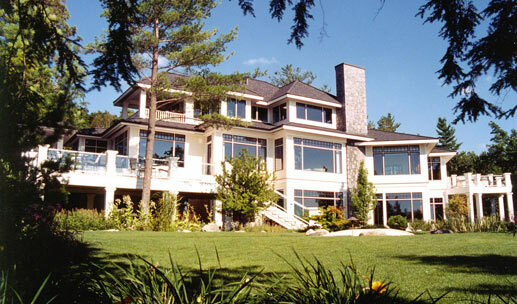 Andre M. Poineau Woodworker, Inc. has designed 35 homes on Lake Charlevoix and an additional 12 on surrounding lakes. Our designs have been published and built across the country from North Carolina to Colorado. We have been published in many magazines and hard cover books including Better Homes and Garden, Home, Veranda, Traverse the Magazine, Lakeland Boating, Dream Homes of Michigan, Blue and others. Our design philosophy is to create unique and timeless lakefront homes and cottages which minimize physical and visual barriers between the interior of the home and the lakes we all love. We pride ourselves in placing homes to become a part of the landscape and design for the site as opposed to manipulating the site to accommodate the home.